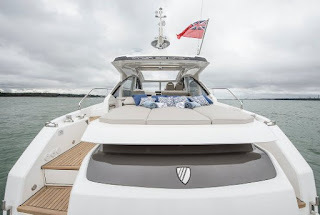 Fairline launch the new Targa 53 Open, a sport yacht which features uninterrupted entertaining above decks with a single level teak floor from cockpit to companionway. The 53 Targa Open is a further development of the 50 Targa and Squadron hull with a complelete redesigned interior and extension to lenght aft. The 53 Targa Open is very similar to the GT patio door enclosed hard top with the main difference coming on the all open main deck. The Targa 53 Open is available as both a two or three cabins configuration. The cockpit boasts a spacious three person sun bed above the tender garage this feature not feature on the GT, a large U-shaped cockpit seating with a wet bar opposite and spacious companion seating across from the helm. The Targa 53 Open is powered by twin Volvo 675hp engines in standard or optional 725hp units.